We have just deployed our exciting new website. We thought this might be a good opportunity to tell you a bit more about the things we like and anything that pops up that we think you might find interesting and useful. Quite often our customers will send us their logo but not be sure of the font style they would like to go with it. When we get requests for “something quirky” or “something scripty” we love to try and find one that fits. During the working day you will often hear the phrase “Ooh that’s a nice font…must remember to write that one down”. In an effort to save on the cost of post-it notes (and maintain workplace tidiness) we thought this would be a good place to keep a memo. We are also very fond of some of the lovely, bright colours in our ink range. Magenta and Pumpkin always look great, especially on a bright, white label. We also think they look good on our cream fabric. 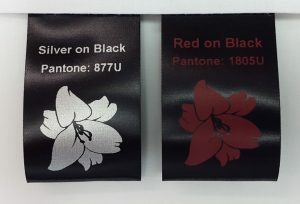 It’s the same ink colour but the darker fabric just gives the colours a little extra depth. We thought you might like to see the difference so we’ve taken some photos of each colour printed on a white or cream base and, for those of you in the designer world, we’ve picked out the closest Pantone reference for each. It has been an interesting project for us. Some of the differences in shade are quite surprising. It certainly took a while looking through all the colour palettes to find the best matches. We know it’s difficult to tell from a screen what a colour will look like in real life so we thought this would be the best way to give you a more accurate idea. We also thought it might be useful if you want to match the colour of other branding items to your labels. We are looking forward to keeping you updated with our other little projects and findings. If we can provide a bit of inspiration too we’ll be very happy. We are always here to answer your questions. For immediate assistance please call 07787 177833 or use the form below and we’ll call you right back.